Can China and the US Work Together on Counterterrorism? Recent events may be making Beijing more open to working with the U.S. on the fight against international terrorism. On November 12, U.S. President Barack Obama sat down with Chinese President Xi Jinping at the Asian Pacific Economic Cooperation (APEC) summit to discuss joint cooperation on a range of international issues. Xi described the talks that took pace during Obama’s three day visit as “constructive” and outlined six priorities in building what he refers to as a “new type of great power relationship.” Among the six priorities discussed between the two leaders were joint efforts in counterterrorism. Beijing had already announced prior to the APEC summit that it was aiming to work alongside the U.S. in its counterterrorism efforts. On October 31, Chinese Foreign Ministry Spokesperson Hong Lei told reporters at a press conference that, “China is willing to start cooperating with the international community in striking out against terrorism.” Driving this newfound willingness to engage with the U.S. on counterterrorism are recent events in China’s far western province Xinjiang. In the past year alone, hundreds of people have been killed in China in violence linked to Uyghurs, a Muslim Turkic-speaking ethnic group native to Xinjiang. The highest profile attacks occurred at a train station in Kunming and at a vegetable market in Urumqi, the capital of Xinjiang. While Uyghur advocacy groups cite heavy-handed repression as reasons for the violence, the scale of recent attacks, the manner in which they were carried out, and the fact that civilians have been targets suggest that China does indeed face a domestic terrorist threat. Yet perceptions of terrorism in China have recently taken on an entirely new hue with the rapid emergence of the Islamic State (IS, also known as ISIS, or ISIL) in the Middle East. In July, IS released a map revealing its intentions to control a significant part of Xinjiang within five years. Then, in September, China’s Middle Eastern envoy, Wu Sike announced that at least 100 Chinese citizens are training alongside IS in the Middle East. Although it is generally accepted that IS’s aspirations to control Xinjiang are highly unrealistic, the fact that Chinese citizens are training with the terrorist outfit has generated considerable concern about the security risk they might pose if they return to China. Al-Qaeda, in its rivalry with IS, has revealed its own designs on Xinjiang. In October, the group released a magazine that describes Xinjiang as an “occupied Muslim land.” With IS and Al-Qaeda vocally expressing interest in Xinjiang, China appears ready to view terrorism in Xinjiang as a global issue. So what exactly are the Chinese looking for in this counterterrorism cooperative framework? A recent article written by Fu Xiaoqiang, a counterterrorism expert from the Chinese Institute of Contemporary International Relations, presents a number of possible policy objectives. With recent increases in violence in Xinjiang, Beijing is concerned about the flow of militants across national boundaries. Intercepting militants as they cross borders is one area Fu identifies that is ripe for U.S.-China cooperation. Fu says that China can use its influence on neighboring countries to push for an effective system of controlling the influence of terrorism across borders. Fu also calls for cooperation in stemming the flow of monetary contributions to terrorist groups claiming “funding is key in recruitment for terrorist groups.” According to Fu, China and America could work closely with Middle Eastern countries to destroy economic resources from online black market outlets. In terms of combating ideology, Fu mentions that China and the U.S. could also work together against online recruitment and extremist propaganda. On the topic of joint U.S. Chinese counterterrorism, Hong Lei announced prior to the APEC summit to reporters that, “Striking against the Eastern Turkestan Islamic Movement is an important aspect in the global fight against terrorism.” He also stressed that there should be “no double standards” in the fight against terror. 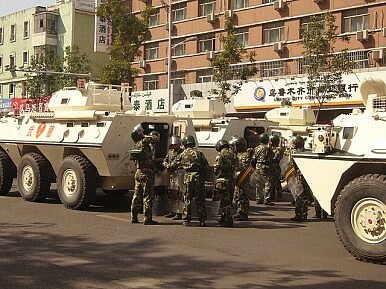 Nonetheless, obstacles remain on the subject of Xinjiang due to concerns over human rights. Obama announced that U.S. support for human rights will continue to play a role in relations with China. This will complicate joint counterterrorism measures that relate to Uyghurs in Xinjiang. Following state crackdowns against terrorism in Xinjiang, religious rights and cultural practices for Uyghurs have been subject to greater restrictions from Beijing. The new policies have drawn much condemnation from rights groups, which can find a sympathetic ear in the U.S. government. While Obama and Xi may well make progress working together in combating the Islamic State, when it comes to confronting terrorism in Xinjiang, they may find themselves with conflicting agendas. Kevin Peters is a writer who recently spent two years studying in Xinjiang. Already grappling with a home-grown terrorism problem, should Beijing fear the Islamic State?